I first saw Handel’s Keyboard across a crowded room. It looked unimpressive. Three tiers of ebony and ivory keys, suspended in what looks like a printer’s frame, are all that remain of the organ given by George Frederick Handel to The Foundling Hospital’s chapel. Later, when my name was pulled out of the tricorn hat and I was paired with it, I was disappointed. I thought the object rather mechanical, austere, disconnected from the deeply poignant essence of children lost and found. I thought the keyboard was boring. My reaction was a throwback to my own childhood memories, of tedious hours sat at a piano keyboard, repeating scales and arpeggios until my fingers ached. Ten minutes of thumping Schmitt’s exercises, as my piano teacher said, “to develop the greatest possible independence and evenness of the fingers”; fifteen minutes of playing Czerny’s piano studies selected for “technique and musicality”; thirty minutes of Handel’s Easy Piano Pieces and Dances. Easy? The title of our writing project is 26 Pairs of Eyes. Its subtitle is Noticing the Unnoticed. What was I not noticing? What did I not see in this rattling set of false teeth? I reflected on our tour of the museum and I vividly remembered director Caro Howell telling us that visitors always wanted to know more about the mothers. Caro called them the ‘present absence’ that permeates the atmosphere of the place, the unknown back-story to every one of the children’s lives. And what about the fathers? They are an absent absence. Very present presences are the founding fathers of The Foundling Hospital. I wondered what a sea captain, an artist and a musician had in common. I discovered that all three were childless. Coram, Hogarth and Handel, without children of their own, took on the responsibility of other men’s children and they did it in a way that epitomised the period which we now call ‘The Enlightenment’. I went to The Foundling Museum worried that I would be overwhelmed by the thought of children, mothers and fathers separated in desperation. I learned that the children were taken in at less than a year old, that they were fostered for the first five years of their lives and then given over to the hospital for their education. Poor little mites I thought. My sentimentality worked against me. I learned, however, that their approach exemplified the old charitable adage: Give a man (or woman) a fish and you feed one person for one day. Teach a man (or woman) to fish and you feed them and their family forever. The Foundling Hospital applied the principle that, from a position of capability, each of us can help ourselves and others. So, back to the keyboard. 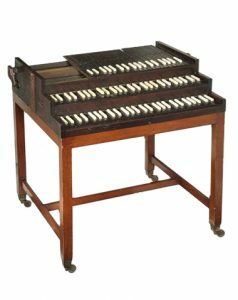 Not only did Handel give his organ to the hospital’s chapel but he also bequeathed four copies of The Messiah in his Will, another one of the 26 objects paired with Rebecca Dowman. The Messiah’s lucrative popularity and Handel’s keyboard, together, ensured that the annual fundraising performances, which unlocked hearts and open purses, would continue in perpetuity. The children had music in their daily lives too. Through hymns and psalms, they learned the discipline of music, its rhythm and metre, its phrasing and beat, its harmony and counterpoint. They learned to sing and perhaps to play. They learned the joy of raising their little voices, which so easily could have been silenced. They learned the value of contributing to a choir and when to stand alone and sing solo. I left The Foundling Museum enlightened. Gone was the dread I had anticipated. I did not find a workhouse of neglect and sadness. I did not find an institution of moralistic certitude. I found a forward-thinking establishment with the conviction that lives are not to be wasted. I found a progressive boarding school with the assumption that all children are born with talents which would contribute to a burgeoning commonwealth. I found a place spoken of, fondly, by foundlings living today as their ‘spiritual home’. I found a keyboard, a gift of practical pleasure from a father to his children. celebration of hope and redemption. Halleluiah! Halleluiah! Halleluiah!